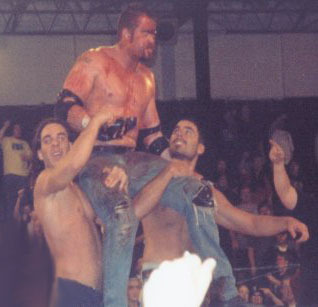 October 25, 2003 – CZW Italy: Wifebeater saved Zandig by chasing Nate Hatred & Adam Flash away with a weedwhacker..
December 13, 2003 – CZW: Wifebeater & Team Ultraviolent defeated Team Hi-V in a vicious Cage of Death V elimination match! December 27, 2003 – 3PW: John Zandig & Wifebeater defeated “Commissioner” Raven & Sandman..
January 17, 2004 – CZW: John Zandig & Wifebeater defeated Tony DeVito & New Jack in a STREET FIGHT 2K4..
January 24, 2004 – 3PW: “Pitbull” Gary Wolf defeated Wifebeater..
April 9, 2004–IWA MS: J.C. Bailey & Necro Butcher beat Corporal Robinson & Wifebeater in fans bring the weapons match..
April 10, 2004–IWA Mid South Wrestling: Corporal Robinson vs Wifebeater in a 2/3 Falls Tables Match was ruled a NO CONTEST..
July 24, 2004 – CZW ToD 3: Wifebeater defeated Mad Man Pondo in a “Fans Bring Weapons” match..
~~~Second Round: Wifebeater defeated JC Bailey in a “Fans Bring Weapons” match..
~~~Third Round: Wifebeater defeated Necro Butcher in an Ultraviolent Death Match to win the Tournament of Death 3!!! 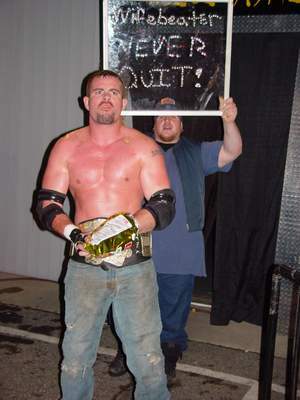 August 14, 2004 – CZW: Wifebeater turned heel, siding with Justice Pain and attacking Homicide! September 11, 2004 – CZW Night Show: Necro Butcher defeated The Wifebeater in a “4-Corners of Pain” match..
October 12, 2004: Wifebeater reportedly went to the home of Johnny Kashmere to “beat him up” (Real Life, Not Storyline)..
~~~This incident was apparently stemming from negative comments Kashmere had made on the internet about CZW..
August 12, 2006 – CZW: Wifebeater (sub for J.C. Bailey) defeated Danny Havoc..